All during nursing school, The 5 Stage of Grief by Elizabeth Kubler-Ross were engrained into my head. All during nursing school, The 5 Stage of Grief by Elizabeth Kubler-Ross were engrained into my head. These relate perfectly to PPD. 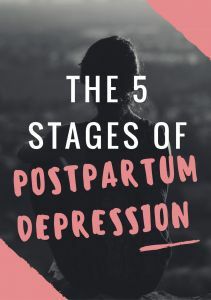 Here are my 5 stages of grief Postpartum Depression: Denial occurs in the stages of postpartum depression first because it helps us to deal with the loss effectively. The loss, in this case, is the loss of your old way of life before baby.